Texting My Pancreas: The t:slim Air Bubble Dilemma. Editor's note: as always, nothing on this site should be taken as medical advice. I am sharing some troubleshooting I've done with my insulin pump and if you'd like to recreate anything you see or learn in this post, please know that you are doing so at your own risk. If you're unsure, contact your insulin pump manufacturer to make sure you aren't going to void your insulin pump warranty with whatever you're wanting to try. I cannot be held liable if you accidentally turn your functioning medical device into a really expensive paperweight. My pump likes to err when it comes to air. It seems that air bubbles (which, according to Tandem's safety information, can compromise insulin delivery) like to gather in the connector area where the "pigtail" - at the end of the couple inches of tubing that comes directly out of the cartridge - and the luer lock of my tubing meet. I've also noticed a bunch of tiny air bubbles (a Tandem rep I spoke with referred to them as "champagne bubbles") that accompany the insulin I'm priming through the tubing with each new cartridge change. Yeeeeah, that can't be good. That Google search also led me to a YouTube video from a fellow pumper named Scott who has some fairly unique ideas on how one might combat air bubbles. I've tried a variation of his method a couple of times and while I'm still getting the hang of it, it does seem promising to me so far. Actually, it's kind of brilliant (and more work than it seems like you should have to do, but if it works...). Scott told me he's relatively new to pumping - he started using his first pump, the t:slim, last November after years of MDI - and applied some of the same principles he knew from multiple daily injections to his t:slim cartridge changes. He's also an engineer by trade, so yeah, that probably helps. I realize that having to bang the side of an insulin cartridge with a Swiss Army knife (is that what he uses?) isn't an ideal solution, but sometimes you have to improvise. (I actually use the old cartridge as my "hammer" of choice, but you do you.) The two key things here for me are the angle at which you're holding the cartridge when pulling the air bubbles out, and the whole in-out-in thing you're doing with the syringe. At the same time that I started trying out some of these techniques, I also reached out to Tandem Diabetes (makers of the t:slim) to see what their take is. They said they're aware of the air bubble that tends to appear at the connector - the rep even commented that she sees them too, in her demo pump. We ran through all of the normal troubleshooting bullet points - is the insulin room temperature when you're filling with it, are you keeping the pump pigtail-side up when filling and priming, are you making sure there are no air bubbles in the filled syringe (for the record, I don't think I've ever been able to get every air bubble out of a filled syringe - it's just the nature of the beast - but I am usually able to flick the side of the upside-down syringe enough that they all collect towards the plunger, and I stop just short when filling the cartridge so that these bubbles stay in the syringe) are you making sure the luer lock is tightened all the way, etc. One idea that a Tandem rep gave me and I've tried with success is: when priming the tubing, don't connect the tubing to the pigtail before the fill starts. The pump requires you to prime a minimum of 10 units each time, so what you can do is prime most of your air bubbles out before you attach the tubing. (The thinking here is that a 3 inch piece of tubing is a lot less space for air bubbles to escape through, than through 20 inches or more.) Once you've hit the 10u mark - or if you're feeling especially dexterous, you can just do this part once you see insulin at the top of the pigtail and all of the bubbles have escaped, and the pump is still priming - attach your tubing and continue to prime. It seems like some combination of these processes might work best for me, and I plan to keep experimenting. If you're using a t:slim - what have you tried? Are you getting the same air bubbles I am, and if so, what are you doing to avoid them? Yes. This is 1 of 2 critical flaws with this pump that make me loathe it. I've been using the "pull air-out with syringe" + "tapping" + "prime without connecting" technique and it helps. In all honesty, I used the tapping (banging) technique on my Medtronic pumps too. The pump would eventually get hairline cracks near the top of the pump. However, with the Medtronic pump, you could see when you got the bubbles out of the reservoir. On the T:Slim its literally blind faith. It makes me wish the housing of the cartridges was clear - at least I could see what's going on that way! Of course pre-filled cartridges with the insulin of your choice would ideal. Absolutely. I love that about the Snap pump. I will give this technique a try and see what happens, otherwise I just kind of ignore the bubble after other t:slim users told me not to worry about it. Thanks for sharing Scott's video. I ignore those bubbles and have never had a problem. As long as they don't end up in the main tubing, I don't even consider them bubbles. As someone looking at getting a Tslim, this sounds like a lot of extra work and a long process. Is it really worth it? I'm not sure if you're asking me specifically, or other commentors, but: I do not regret choosing t:slim. Each pump has its quirks; this is one for the t:slim! This is one of the big factors that influenced my final decision not to buy a t:slim. No matter what I tried, I couldn't get rid of all the air bubbles. Even when it seemed like I had, there were times when I experienced unexplained Highs -- the kind that Tandem liked to tell me was "user error," but ones that I've NEVER experienced in any of the many other pump types I've used in my 13 years of insulin pumping. Ultimately, what seemed like an inconvenience at first turned into a fundamental distrust that I wasn't getting all of the basal or boluses that the t:slim said I was and some off-label experimenting of my own determined that was pretty much true. I've heard others comment that they don't think the t:slim has enough power/force, thanks to the micro-pumping mechanism, to force all of the air bubbles out like other pumps do in their more traditional reservoirs. I have no idea whether that's the case or not, but it makes sense to me. And in the end, I'm glad I didn't buy one and decided to wait and see what the next gen t:slims bring us. In the meantime, glad there's posts like this that bring the issue to light and highlight these tricks like Scott mention in the video. I do hope Tandem addresses this. 1) After filling the cartridge, tapping it, to move the air to the top (similar to how Scott shows it in the video, even though I don't remove the cartridge from the pump). 2) While priming, I tap the connector (right where the air bubble collects) to losen the air bubble and get it into the main tubing, so I can prime it out. This is unelegant, but it usually works pretty well. It wastes a few units of insulin (between 2 and 5 I would say, depending on how much air is in there and how fast I can get it all to dislodge), but I think it's worth while. Even though I find this (and a few other things) annoying, I still like the t:slim a lot, and don't regret my decision for it. I guess, as you said, that every pump probably has its own issues. Also, I've been reading your blog for at least 2 years and I love it! This is my first comment, so that had to be said. So glad to hear from you, Eva! It's both reassuring and troubling to me that I'm not the only one with these air bubble issues. Ok, I feel a little bit famous because you linked to my TuD posting. That's gonna carry me through the day. In the interest of disclosure, I have to admit that I'm off my tslim. I never did really beat the bubbles - that stupid big one always shows up and reappears in my pigtail. It won't leave me alone. Like Mike, I also had more than few unexplained highs that (in my mind, with no testing other than righteous indignation) I attribute to inconsistent basal delivery. I will say, I can't remember a time that the big bubble moved itself into the main tubing; I always had to flick it out. I think the quirks of the tslim became too much for me and I went to the other end of the spectrum - the Asante Snap. 1980's user interface, 30 second cartridge change out. I still really want to love my tslim, and I'm in this ongoing chat with customer service to solve some of the cartridge errors and phantom occlusions that made me tear the thing off last time. So, every few months I through in a cartridge and hook myself up...and hope. That tubing connector thing is BIG! That's weird! In looking at this T-Slim pump at the ADA show in Chicago, I noticed all the tubing was short... its because none of them had this connector thingy. How- and where does one hide that?!? I'm very grateful you described this problem and let us know about it. Thank you for posting, and thanks to all the commenters too. My solid and reliable Cozmo is over two years out of warranty and I'm far from ready to give it up. 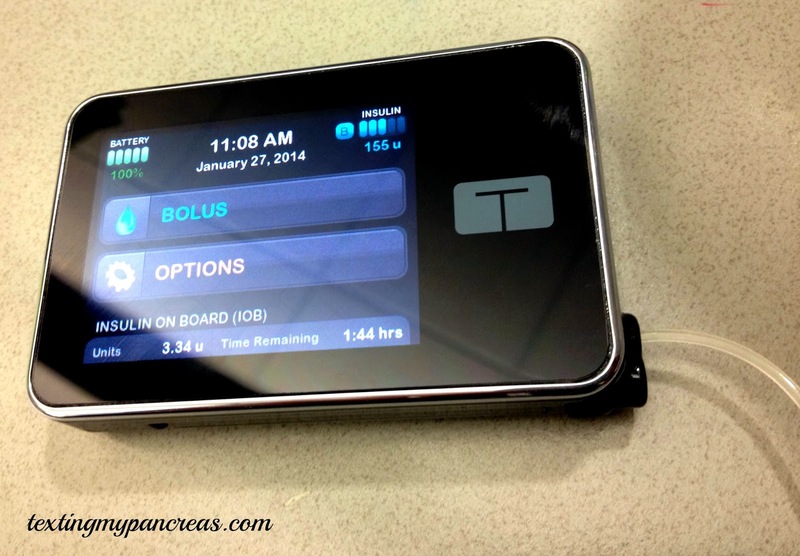 I had considered trying the T-slim, but doubt about insulin arriving in my body is the number one deal breaker for me when it comes to pumps and infusion sets. I'd rather take shots. 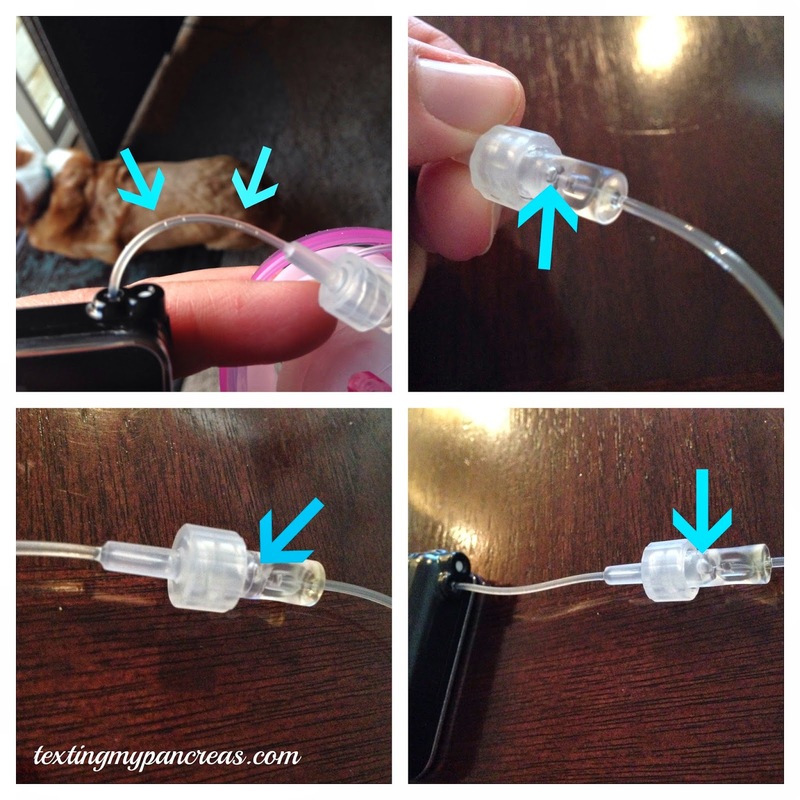 "when priming the tubing, don't connect the tubing to the pigtail before the fill starts. The pump requires you to prime a minimum of 10 units each time, so what you can do is prime most of your air bubbles out before you attach the tubing" <---BRILLIANT! Psyched to try. I kind of hate this. I didn't know that I hate learning new things.